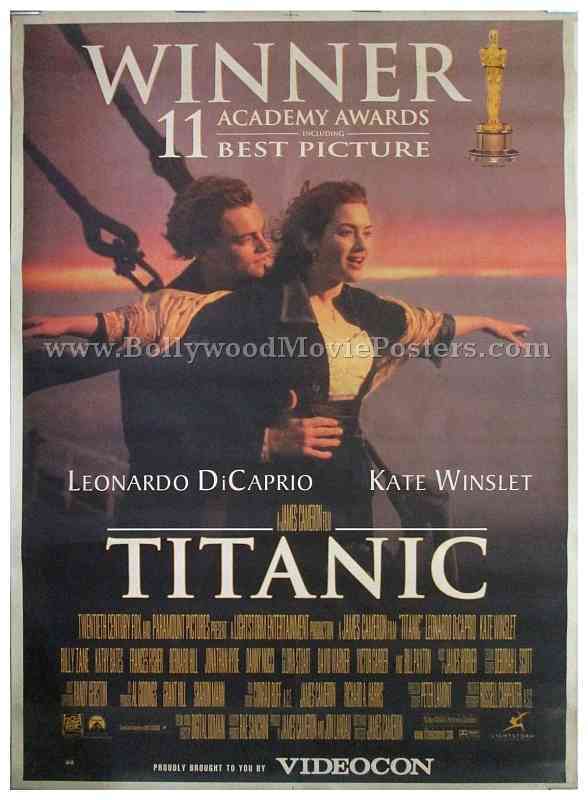 Old Hollywood movie poster of one of the biggest blockbusters ever made in the history of cinema, Titanic (1997) for sale. Featured here for sale is an actual surviving original Hollywood movie poster of the James Cameron epic, Titanic. Printed in India during the local release of the film somewhere in the late 1990s, this old Titanic movie poster was originally intended for publicity of the film but never ended up being used. At the time of its release, Titanic was the most expensive film ever made, with an estimated budget of $200 million. The film received both critical as well as commercial success. Titanic was nominated for fourteen Academy Awards – the highest Oscar nominations ever received by a single film. It won eleven, including the awards for Best Picture and Best Director, establishing another record of the most number of Oscars won by a single film. Titanic is one of the greatest blockbusters ever made in Hollywood, making this poster highly collectible! This original Titanic movie poster capitalizes on the success of the film at the Oscars by announcing the same in prominent letters on the top. Titanic is a 1997 Hollywood epic directed, written, co-produced, and co-edited by James Cameron. Based on the sinking of the RMS Titanic, the film stars Leonardo DiCaprio and Kate Winslet. Titanic was the first film to reach the billion-dollar revenue mark. It remained the highest-grossing film of all time until James Cameron’s Avatar surpassed it in 2010.